Vixx Handmade Cards: WHIFF OF JOY DT POST ~ PRECIOUS..
WHIFF OF JOY DT POST ~ PRECIOUS.. 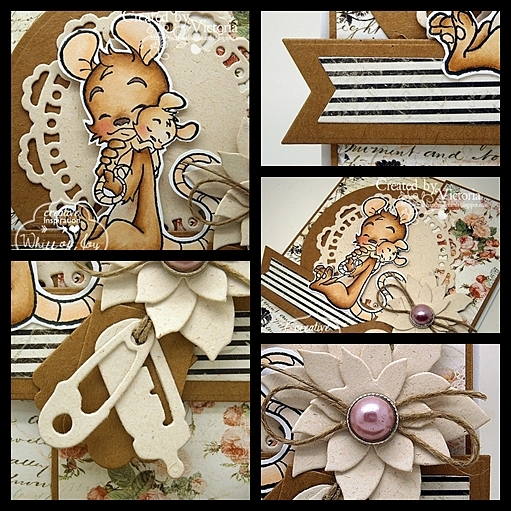 Anyway....onto my card...and today I have played with adorable Henry Mouse from Whiff of Joy. This cutie is called "Precious"...and methinks it's perfect for new baby cards..
Oh I do love your fab designs lovely, great card! This image is adorable Vicky. Fabulous design and I love the papers. Super design and colouring Vicky. Oh what a lovely card Vicky!! Oh that is just tooo precious Vicky! This is gorgeous Vicky, such a sweet image and I love the papers and fabulous layout. This just to sweet...wonderful as always! love popping in to see what you made, b/c your very inspiring to me. So beautiful card Vicky,I love the image and the paers. Awww..what a lovely image Vicky, gorgeous colouring and details..and love the papers..beautiful. Beautiful creation Vicky, love the sweet image and very pretty details. Aaw totally sweet, what a fab image. Great all round card with fab layout and die cuts. Adorable and so gorgeous Vicky. Oh what an adorable image, such a sweet card! Super super sweet baby card!! !